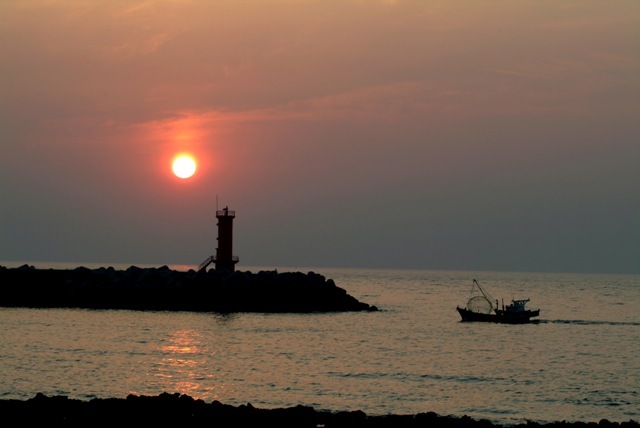 Jeju’s best night viewsWhere is the best place to catch a sunset on Jeju? As an island perhaps most famous for Seongsan Ilchulbong and its famous sunrise, it will perhaps come as no surprise that Jeju also offers some incredibly beautiful night views. Due to the location of the setting sun and the interesting geographical features of the area, some of the best of these views can be found on the north western coast of the island. Whether views of the sun setting over the sea, the outline of Mount Halla or the sparkling lights of the city at night, view seekers on Jeju will certainly be able to find something that takes their fancy. Sarabong is a 148m high oreum located to the east of Dongmun Rotary in Jeju city. The peak is famous for its spectacular sunset views that stretch out over the ocean. Those who visit Sarabong at night get to see two of Jeju’s best views; if you look north you will see magnificent views of the blue ocean while if you look south you will see the imposing outline of Mount Halla. Suweolbong at the far west of Jeju island is a 77m high peak. However instead of being a gradual peak like most of the island’s hills, Suweolbong is an almost flat bed of layered rock. This unique rock formation means that Suweolbong is one of 12 geosites on Jeju with Global Geopark Status. 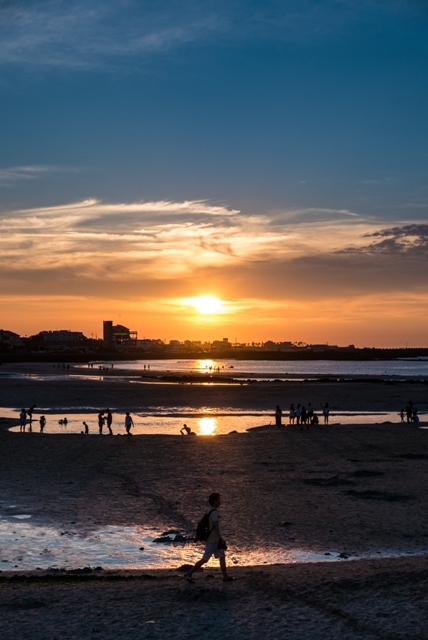 As well as beautiful night views of the sea and surrounding farmland, at Suweolbong you can enjoy nature while learning about some of Jeju's history. Gwakji Gwamul Beach in Aewol is one of the best beaches on the island. Its pure white sand contrasts strikingly against the turquoise sea. As a fairly large beach, it isn’t usually too crowded with tourists, despite its beauty. 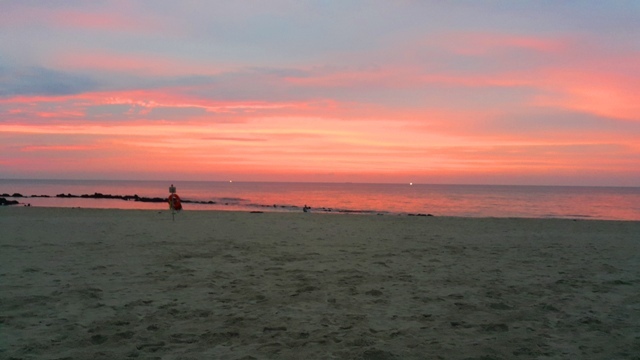 Visitors in the evening can enjoy the night views while camping and eating some delicious barbecue with friends near the beach. Dodubong is an oreum situated just before Iho Tewoo Beach when traveling from the city. Visitors to Dodubong are greeted with spectacular views of the sea on three sides of the oreum. As Dodubong is just outside of Jeju city, from the top you can also get great views of the whole of city. Hyeopjae Beach is renowned for its pretty sand shellfish call Paesa. The shallow, warm water and campsites in the nearby pine forest make it a perfect beach for young families. Its location to the west of Jeju city, as well as the nearby Biyangdo island which you can see from the beach, mean that night views on Hyeopjae are unlike any other on Jeju. Chagwido Island is located just before Suweolbong at the western end of Jeju Island. On the island is a small hill and due to its location to the west of Jeju, around sunset, Chagwido's seashore turns crimson red from the sun. This truly is an awe-inspiring sight to behold and arguably one of the best places to see a sunset on Jeju. Iho Tewoo Beach is a popular beach near to Jeju city. It is a gently sloping golden sand beach set against the backdrop of a pine forest. Iho Tewoo Beach’s natural beauty and close proximity to the city make it a popular place for tourists. Visitors to Iho Tewoo Beach in the evening are greeted with hundreds of sparkling lights coming from the fishing boats that set sail in the evening.